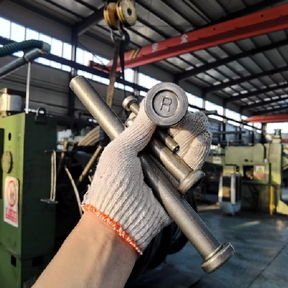 The company produces shear stud connectors in different size and material. Size ranges from diameter Ф10mm~Ф25mm,length from 50mm~300mm, material is in SWRCH15A, ML15AL or ML15. We use the material produced by well known big sized iron & steel plant for manufacture the studs. All products are checked and inspected according to concerned standard, such as GB10433-2002, ISO, ANSI/ASME (USA) as well as DIN (Germany). We can custom make lengthen shear stud connectors, please contact us for more detail information.The shear stud connectors is manufactured strictly according to concerned standard, which has obtained CE certificate (series No. AC/0500909). It carries out other standards also, such as Japanese Industrial Standards cheese head studs (JIS B 1198-2011); USA Standard welding stud bolts (ANSI/AWSD 1.1); USA Standard stainless steel welding stud bolts (ANSI/AWSD 1.6). The shear stud connectors is manufactured by strictly quality control from material to each process till the end product. Therefore, quality and each technical performance are well met concerned standard.